Taiwan is a small island but with high density of population living in the cities. Therefore, most parks you can find in the city are small in size and not to mention with special function within them. Biking lanes are especially rare (hard) to find. Most parks do not allow people to ride bicycles in the park! But Wenxin Forest Park is the special one. Although it is only 8.86 hectares in size, it does create a two-way bike lanes for people to enjoy biking. You can see many people bring their kids to this park and enjoy quality family time together in the day time. And it is very close to Ikea which people can easily go shopping or simply relax afterward. Another special function about Wenxin Forest Park is the Fulfillment Amphitheater located inside. This is a large-scale outdoor theater which can accommodate 6000+ people with seats and up to 15000 including the surrounding green grass areas. Since 2006, a wide variety of artistic and cultural events have been held here. It provides not only a venue for top-quality cultural and recreational activities in Taichung, but has also helped to encourage the general public's participation in arts and cultural events. 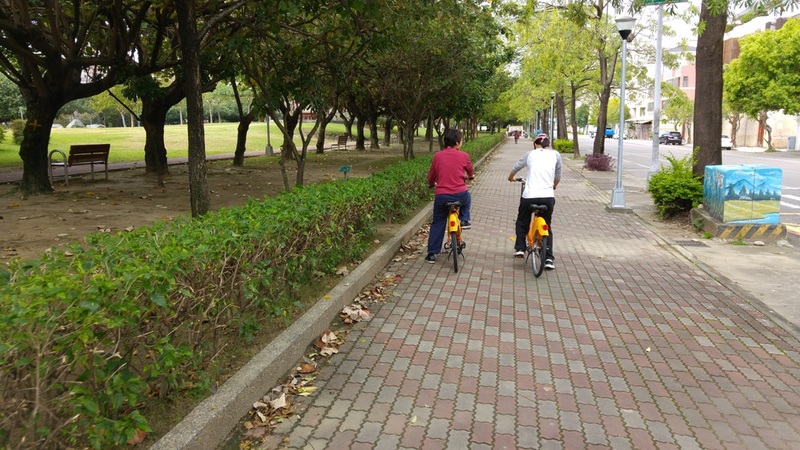 Wenxin Forest Park is another point of our biking tour in Taichung City, and we invite you to enjoy and explore this city by cycling with the public sharing system, iBike.